Gas mask infront of Syrian flag. The death toll has been estimated to be between 500 and 1,300. This later caused the United Nation Security Council to have an emergency meeting in New York. The meeting resulted in the agreement to have an investigation by the U.N. inspection team. On BBC President Barack Obama declared a military strike on Syria, but only if congress approves. Early in September President Obama said that a military strike against Syria would “absolutely” be avoided if it follows a Russian proposal to surrender its chemical weapons stockpile. In an interview with Fox News conducted by former U.S. Rep. Dennis Kucinich, embattled Syrian President Bashar Assad admitted his country possessed chemical weapons, but pledged to destroy the arms. 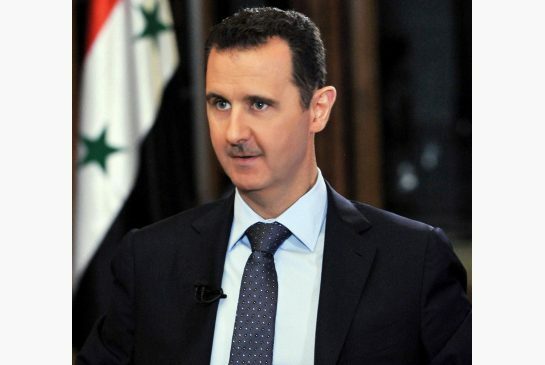 Assad warned, however, that the process would take at least a year and would cost nearly $1 billion. President of Syria, Bashar Assad, in an interview. According to CNN, “The Syrian civil war has birthed rebel groups across a wide ideological and geographic spectrum.” Some are nationalists bent on liberating their country from a ruthless regime. Others view the conflict as a springboard to a global jihad. A large umbrella organization, rather than most rebel organizations which have cohesive fighting force. The FSA is working with demonstrators to bring down the oppressive regime. The groups identify with the ideology of the Muslim Brotherhood. They want to replace the secular canon with Islamic law, curtail individual freedoms, and subordinate minorities. These groups consist of Muslims who seek to return the Islamic community to the first three generations following its birth. They shun modernism and Western influence. Associated with al-Qaeda, they are now the most powerful groups on the battlefield. They use suicide bombing, targeting both civilian and military targets. According to SciShow, Sarin gas is a chemical that kills by bonding with a serine protease called acetylcholinesterase, which breaks down acetylcholine, a neurotransmitter. Acetylcholine and acetylcholinesterase are what cause muscles to contract and relax. When Sarin gas bonds with acetylcholinesterase, acetylcholine is never removed, so instead of the muscles in the body flexing and relaxing, they can only flex, which causes the entire body to cramp up. Sarin gas is oderless and colorless, and can be absorbed through the lungs and skin, it then causes the diaphragm to cramp and it locks the lungs in place, causing terrible pain and death. Sarin gas also breaks down into harmless chemicals only weeks after use, making it impossible to tell if the gas was ever used. It kills quickly, and antidote can only be taken immediately after exposure in order to survive. 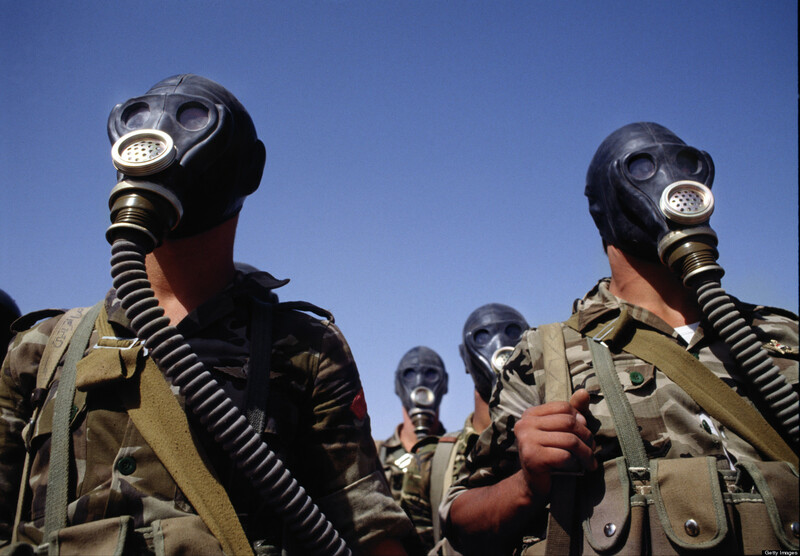 Sarin gas is classified as a weapon of mass destruction, and is banned from use in warfare. 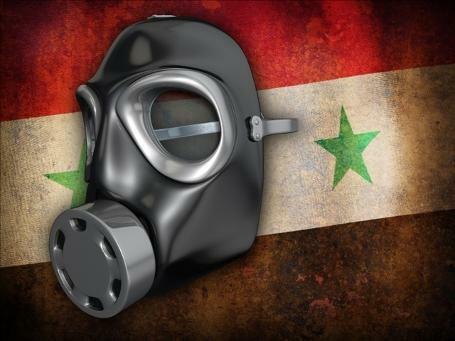 It is still unclear, and the world is still uncertain, whether or not the chemical weapons were used by the Syrian government or Syrian rebels. A man standing over victims of the gassing in Syria.